With about 20 acres filled with orange trees, rose bushes, cacti, palms and olive trees,La Mamounia is surrounded by beauty. But it doesn’t just end on the hotel’s verdant gardens, which used to be owned by Prince Mamoun in the 18th century. From the moment you step through the front doors of this palatial Marrakech masterpiece, you’ll be immersed in stylish grandeur. Light and color play off one another to entrance you, while distinctly arabesque artwork, lush velvety fabrics, warm woods and the gentle sound of running water from the lobby’s fountain complete the sensory experience. In addition to the fragrant grounds and fetching design,La Mamounia is the place to visit for a fabulous poolside brunch or breakfast or for delectable desserts fromFrance’s Pierre Hermé. The lobby is a stunner with its colorful zellige tile work, fountains and ponds. Accompanied by the sweet scents of jasmine, orange blossom and cedar, the space will make you want to linger. Don't miss a stroll through the Forbes Travel Guide Four-Star hotel's lush gardens. Alfresco tea at Le Menzeh is an afternoon treat. If you feel like being pampered, visit the luxurious spa to enjoy a treatment, lunch by the pool and an afternoon of doing absolutely nothing. 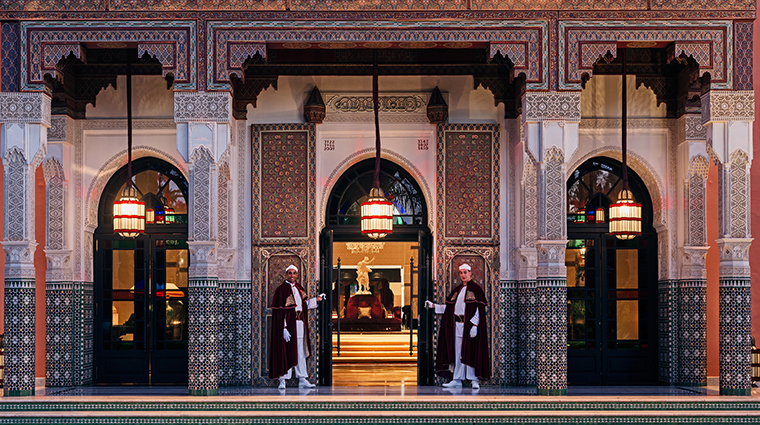 La Mamounia is steeped in history with the likes of Winston Churchill (stop by the bar named after him), Charlie Chaplin and Alfred Hitchcock as past guests. Sitting directly inside the city walls of Marrakech’s old medina, La Mamounia grants you easy access to the markets and historical sites. The Marrakech hotel offers an exceptional boutique of La Mamounia products as well as curated objects from some of the top designers in and around the city. Keep in mind that La Mamounia enforces an “elegant” dress code, in all public areas, including the dining venues. Shorts are prohibited in the restaurants and bars after 6 p.m.
All bath products are unique to the hotel featuring a signature fragrance by world-famous perfumer Olivia Giacobetti. 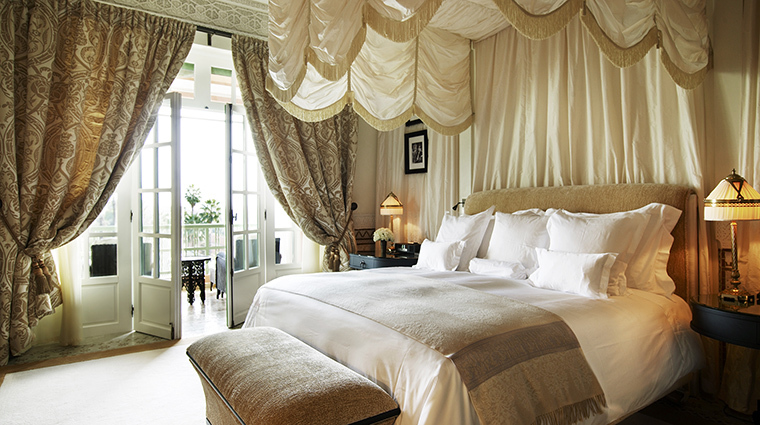 There are 207 rooms, each featuring Moroccan craftsmanship of woodwork, stucco and tiling. 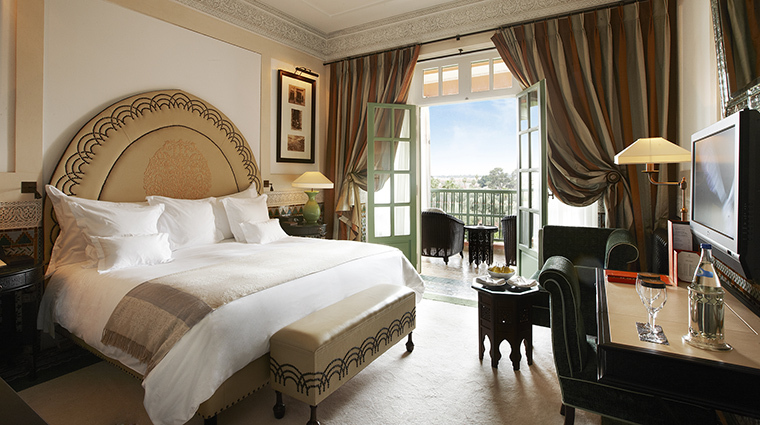 The restoration of the hotel changed the room style to bring in elements of traditional riads with a luxury feel. Each of the accommodations has a choice of three exterior views: the impressive Koutoubia minaret, the lush park or the Agdal Gardens. 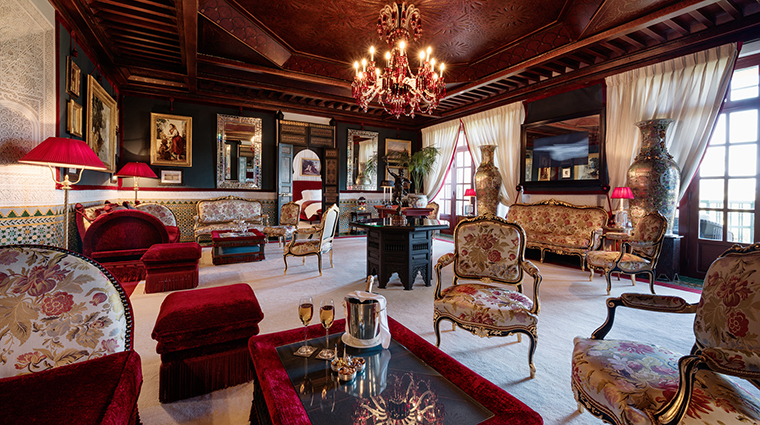 Up your experience by reserving one of the seven exceptional suites. Each is distinct and includes VIP service on arrival and throughout the stay. Situated inside La Mamounia’s property, three secluded 7,500-square-foot, three-bedroom riads offer the ultimate in privacy. 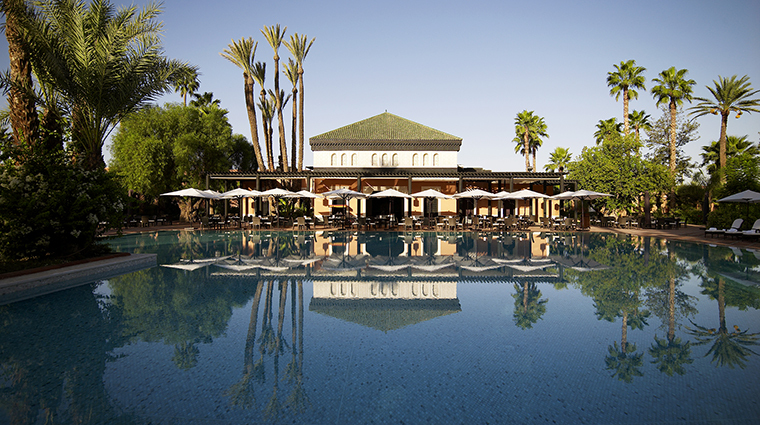 Each riad surrounds a central courtyard and pool with the exterior walls facing the lush gardens of the hotel. Deluxe rooms and higher categories also have a terrace, a wonderful spot to enjoy drinks or to simply sit outside your room to relax. Don’t miss a visit to the luxury hotel’s sweets shop from Pierre Hermé, one of the world’s top pastry chefs. In Hermé’s first Africa boutique, order his famous macarons or the 2,000 feuilles, delicate layers of caramelized puff pastry crust, praline with Piedmont hazelnuts and praline mousseline cream. Breakfast and Sunday brunch buffets are served poolside and are an occasion not to miss. A combination of cold offerings and made-to-order hot dishes is available. Le Marocain opens for dinner daily as chef Rachid Agouray prepares modern Moroccan dishes with ingredients from the hotel garden and sourced from the local area. L’Italien and Le Francais provide Italian and French cuisine, respectively. Both are open for lunch and dinner and allow you to enjoy dishes that change with the seasons while being surrounded by opulent furnishings. A stop at Le Churchill bar is a must for jazz lovers and anyone wanting to soak up the traditional ambiance of La Mamounia. This is where to go for a classic cocktail and conversation with friends.